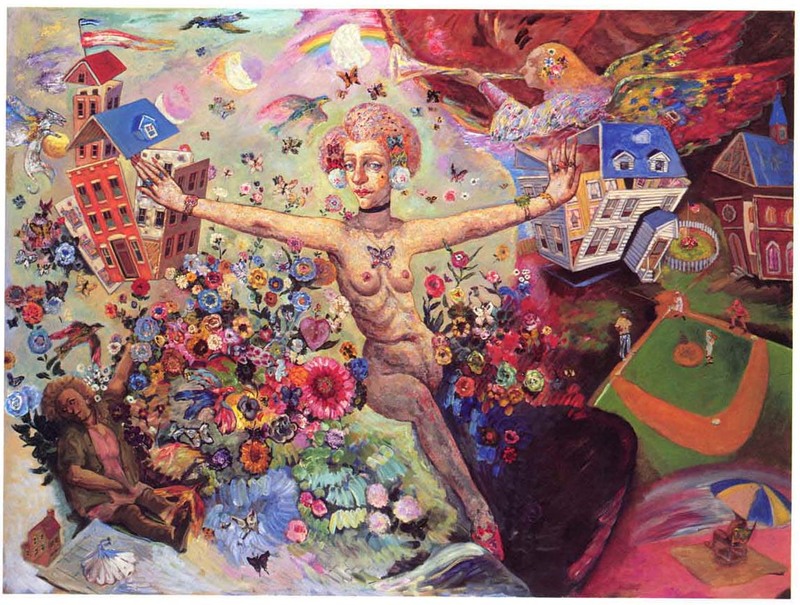 Among Chicago Imagist painters, Seymour Rosofsky (1924-1981) was both the most classically trained and the most puzzling. A second generation, blue-collar Jewish kid from Chicago, Seymour’s talent was recognized early and he ended up studying oil painting with Boris Anisfeld at the Art Institute. He picked up that Russian’s dreamy, decorative style, which might be called classical but was hardly naturalistic. As Anisfeld once said “I always see a thing first in color and I paint what I feel, not what I see.” Rosofsky also became an art-museum junkie, both in Chicago and Paris, drawing from a variety of primitive, post-impressionist, surrealist and expressionist art. But when he put it all together, it was all about himself. There’s a musty, cluttered, claustrophobic feeling about his work, with the viewer often placed in the role of the therapist puzzled by the highly emotional, confused world of a patient who feels trapped in a female-dominated, family-centered life. In a 1972 review in Time Magazine, Robert Hughes called Rosofsky’s work a “wretched thesaurus of clichés,” while in his first posthumous retrospective, the Chicago Tribune’s Alan Artner noted the “loose ends” and “a tendency to overload his pieces.” Doubts have even been raised about his technique. Hughes called them “clumsy paintings,” though Franz Schulze applauded his “rich color, carefully interwoven tonalities and assured drawing,” especially in comparison with the brutally clumsy or severely cartoonish neo-expressionism of the 1980s and thereafter. Through September 4 at the Elmhurst Art Museum, 150 Cottage Hill, Elmhurst.